Is Apple Treading Similar Path As Nokia & Blackberry? Stock price of Apple Inc., one of the most recognized global brands in the tech industry has been trading at $431.72, a beat down of almost 40% from its all time high of $705 it had touched last September. The company and its stock has been facing the music from its investors and analysts, the optimism in the tech giant’s stock seems to have faded away as analysts are no longer confident and excited about the future of the company. The popularity and sales of iPhone5 has been way below expectations, they have been nowhere near the unprecedented heights reached by its predecessor iPhone 4S. Lack of clarity on “What’s next?”, “Whats in the making?”, “What measures are they taking to boast stagnant and trailing sales?” has been yet another cause for worry. The Tech Goliath hasn’t till date disclosed details on the innovations they are pursuing to come up with yet another “jaw dropping” product. The Apple maps fiasco hasn’t helped either, leading to reshuffle at the top leadership. Competition has been catching up and growing at a fast pace. Samsung has been a major thorn, offering competitive products at strategic pricing. Drowning confidence is bound to give way to uneasy questions, “has Apple’s stock foreseen its future ?, Is it going in the same direction as Nokia and Blackberry?”, more importantly is it “running out of fizz”? are few of the several questions which have been knocking investor’s mind. “Running out of fizz” phenomenon is not new to tech stocks as fortunes of tech companies change overnight. Stocks like Nokia (NOK) and Blackberry (BBRY) had witnessed a hammering in their prices when their respective products failed to meet expectations of investors and analysts on the street. The tech duos of the mobile industry are still in the same messy situation: Nokia’s Lumia series has not been meeting the required sales and Blackberry Z10 seems promising but a late entrant, oh yes, it promises to create a deep hole in consumer’s pockets! Stock price of Nokia (NOK) had started feeling the heat from October 2007 when it was trading at $40, the blood massacre of its stocks hasn’t yet stopped. 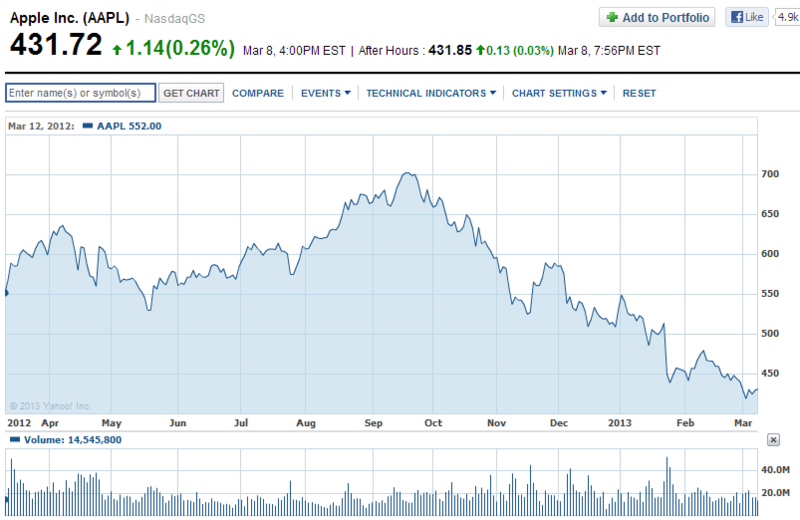 Lack of innovation in Nokia handsets has been one of the primary reasons for the poor performance of its stock price. The company whose devices were powered by Symbian OS, witnessed huge drop in its sales, plunging nearly 50% from $50.71 billion in 2008 to $30.18 billion in 2012, profitability of $4 billion changed to loss of $3.11 billion in the same period. Blackberry (BBRY), once the toy of corporate executives, thanks to its email and BBM services, faced similar music when its share plummeted from a high of $145 in June 2008 to a low $6.46 in September 2012. The stock which is still struggling to make a mark, has been trading at $13.06 having moved up marginally majorly due to the launch of its latest offering Blackberry Z10. However, the recent euphoria with the launch of Blackberry Z10 seems to fizzle out as the company could not meet the expectations of its customers to drive from an Apple or an Android Phone. In last several months, Apple has been continuously losing its charm amongst investors, its forthcoming portfolio is just limited to another variant of their existing line of products, iPad, iPhone or diminishing iPod. It has transformed from being a phenomenal company during the reign of Steve Jobs to being just another tech company after his death. The company has a cash pile up of nearly $40 billion which is nearly 12% of its market capitalisation leading to ‘cash obesity’. Product innovation has been the USP of this company, that has to continue, if that doesn’t then it won’t be too far when Apple would be termed as the next Blackberry or Nokia.